Opportunities for international research are rare when working in a regional museum. So when one arose I grabbed it with both hands. Thanks to two external specialists, Martyn Rix and Henry Noltie (of Royal Botanic Gardens, Kew and Edinburgh respectively), we already knew that a group of 86 beautiful Indian paintings of plants and animals in RAMM’s collection were important. The works were painted by Indian artists under the instruction of European scientists while India was under British rule. They also recognised that the plants depicted were economically useful for medicines, dyes and timbers. So in 2016 RAMM displayed half of the works in an exhibition called Flower Power – Botanical Drawings from India. The artworks were all conserved through funding from Arts Council England’s PRISM fund, as outlined in this article Preparing for Flower Power. Sheah Gosh. Watercolour and gouache, c.1770-80 by an unknown artist. Cresswell collection. © 2018 Royal Albert Memorial Museum & Art Gallery, Exeter City Council. This depiction of a lynx is by an unknown artist. In Urdu it is known as ‘siyah gosh’ meaning ‘black-eared’. The animal was probably kept in a menagerie. Who painted them and when? – On 17 of the drawings there are signatures in Bengali on the reverse and an English translation but reference books and Google had been no help. Who painted the unsigned works? Who were they painted for? They are Company School style so were they commissioned by the British East India Company? Why were they painted? – To scientifically record India’s flora perhaps, or for more commercial purposes? How did they come to be in the possession of Rev. Richard Cresswell – an Englishman who had never visited India? They were excited and a collaborative research project was born! Lecturers Nandini and Andrew, and visiting curator Jayanta; at the Victoria Memorial Hall. © Holly Morgenroth. We quickly learnt that the English translations of the Bengali signatures were unhelpful. Dr Chatterjee examined the signatures and realised that our works were by three very significant Indian artists: Zain al-Din, Ram Das and Bhawani Das. This trio are also represented in the V&A, Ashmolean and the Metropolitan Museum in New York. Around 1770 they were employed by Lady Mary Impey (wife of the Chief Justice of Bengal Sir Elijah Impey) and Sir William Jones (a judge and oriental scholar in Calcutta, now known as Kolkata). 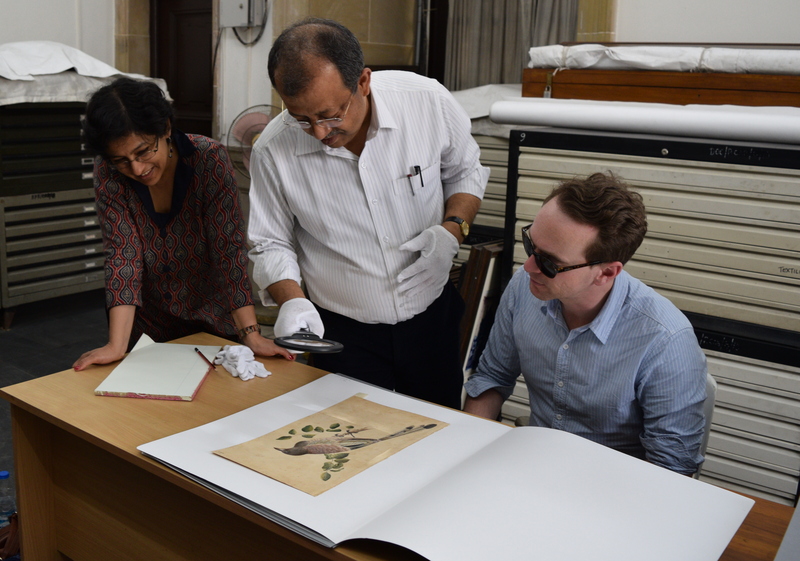 Dr Sengupta, curator of the Victoria Memorial Hall in Kolkata, invited us to visit and explore the Fleming collection of botanical and zoological paintings. John Fleming was an East India Company surgeon who was in charge of the Calcutta Botanic Garden 1793-1813 and there are strong similarities between RAMM’s Cresswell collection and Fleming’s. 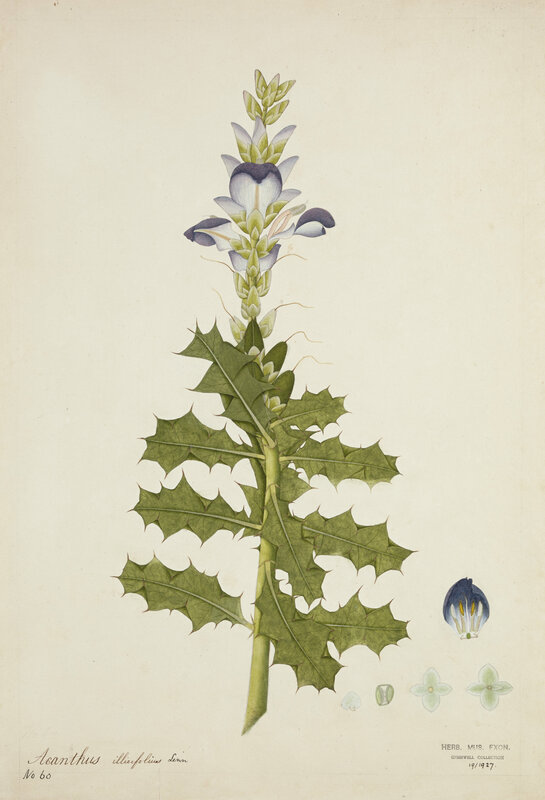 During our very brief visit to India we also studied a collection of botanical paintings commissioned by William Roxburgh, Fleming’s predecessor at the Botanic Garden. Sea holly (Acanthus Ilicifolius). 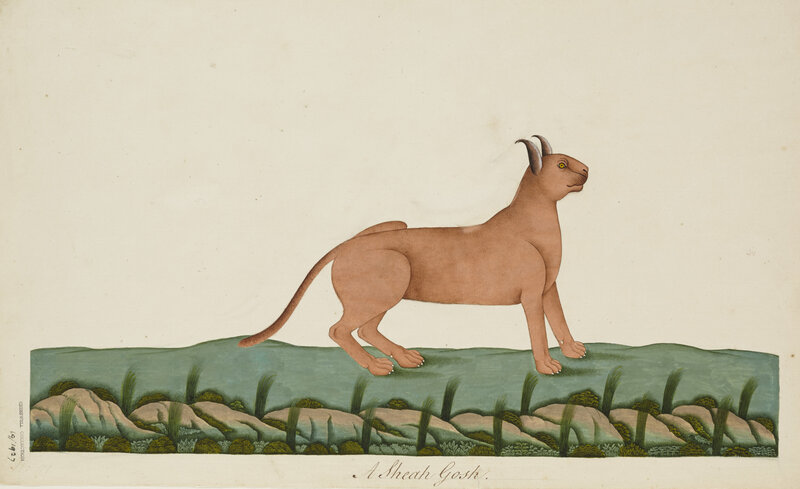 Watercolour and gouache, c.1770-80 by Bhawani Das. Cresswell collection. © 2018 Royal Albert Memorial Museum and Art Gallery, Exeter City Council. Sea holly, known in Hindi as Harkata, is known for a range of medicinal uses, including as an antiseptic, and for the treatment of burns. The really exciting news is that I am lucky enough to have been awarded a travel grant by ICOM UK to return to India in November. During this visit the university team, Dr Sengupta, and I will explore the possibility of developing a research project to uncover the networks of painters and patrons in India in the late 18th and early 19th centuries. We also hope that answers to as yet unsolved questions regarding both collections will be revealed. This research will feed into ‘Nature’s Empire’, an exhibition that will tour the UK and India in a couple of years’ time – watch this space! Written by Holly Morgenroth, Collections Officer at the Royal Albert Memorial Museum.